Today was a good day because we sent Twizz to her pending home. That's always a reason to celebrate around here. There to see her off was her long-time friend, Edgar. Ed is one of the background heroes of Pit Bull Hall. He gets a very (very!) modest salary to feed and clean the dozens of dogs at the East Bay SPCA, including our pit bulls. It's a loud and smelly job. Just the day-in-day-out routine can cause anyone to hurry on through in order to get all those hungry barking dogs to quiet down again. But Ed's take-it-slow brand of dog care has earned him quite a few pit bull friends -- especially, Twizz. She adores him and they've hit it off in the sweetest of ways. Talk about a stereotype-buster...You'd figure a young guy would be attracted to a big headed boy like Peter or a fancier pit bull with trophy-sized muscles. Nope - turns out the slightly plump, somewhat funny looking Twizz was his favorite. It was a surprise to me, and it made a world of difference to her. You see, Twizz has been in shelters for most of the last nine months... a LONG time. With her kennel situated just across from the 'Get Acquainted Room,' she's had a front row seat to dozens and dozens of lucky non-pit adoptions. Waiting to go home can be hard on these guys (we see signs of kennel stress start after about 4 months), but having a consistent, committed friend can be a lifesaver. Ed slowed down long enough every day to remind Twizz that she was special. He'd nuzzle her ears and climb inside her kennel to let her fall asleep on his lap. I'm sure their friendship made a huge difference in her being able to wait so long and stay so stoic. So... finally, she went home. Ed hung back and watched the whole procedure as the excited new adopter chatted, read instructions and signed papers for her new girl. And no surprise, Twizz stared back at him during most of the meeting. I'm glad I remembered my camera today. Two buddies saying good-bye. Everyone at BAD RAP would like to thank Ed for being Twizz' buddy during these long months of waiting. You made her feel so wanted! Pit bulls everywhere raise a Two Paw Salute to Nann Dawn (far right), who just said good-bye to shelter life to start a new career as an adoption counselor - this time, for kids instead of pets. Pit bulls always know a friend when they see one; our dogs were all in love with 'Big Nann.' She cheered them on in every way, she was aces at talking to pit bull-wary shelter visitors and she helped a whole bunch of pit bulls earn their Canine Good Citizen and Therapy Dog titles. This lady is a true blue Mensch. On to brave new adventures. We will miss you Nann! AB 1634 does not address the very real problem of pet animals being imported into the state from other states, and other nations by animal rights, animal rescue, and animal shelter groups. The hurricanes Katrina, and Rita displaced many animals that ended up in California’s animal shelter system. These animals inflate shelter intake, and euthanasia figures. - From the position statement of a group called "Responsible Dog Owners of the Western States"
Disaster pets: A 'problem'?...Responsible for inflated euthanasia numbers? The many orgs that participated in rescue efforts took pets on in addition to their regular intake of local pets. To do this, they burned the candle at both ends, shouldering the burden of extra work and extra animals and employing the help of foster homes willing to over-extend themselves for a few weeks or months. These are the times when disasters bring out the very best in animal people. Even the AKC got involved to collect money for displaced pets. True enough, unclaimed pit bulls represented the bulk of the Katrina pets that did not leave CA shelters alive. This number was small though, as cargo planes that shipped dogs from gulf cities were reluctant to bring the breed in. We know ... We were watching closely. We can only hope that western states pets will be fortunate enough to have the help of out-of-state rescues and shelters when the "Big One" hits our coast. Who knows? Maybe a celebrated CA show dog, displaced by a monster-sized earthquake, will find his salvation with a kind and willing foster home in Louisiana. Don't be surprised. More AB1634 Myth De-bunking here. NOTE:: While BAD RAP rejects the notion of blaming Katrina pets for shelter deaths, we DO believe that AB1634 needs work so working dogs are not negatively affected, and are currently working towards this goal. Read BAD RAP's AB 1634 link for more info. How much do you want that doggy in the window? Some people go out of their way to avoid pit bulls. People like Jordan did everything in his power to bring one into his life. Jordan's a young man who had a dream of owning a beautiful dog. Planning ahead - his wish list included breeds that would do well with the children he hoped to have someday. After careful research he settled on pit bulls...Smart man. We loved his application. It was full of details, very thorough and he admitted that he knew he had a lot to learn and wanted every help he could get to succeed with his new pet. Music to our ears! He started showing up at Pit Bull Hall to nuzzle a pit-x named Gulliver through the kennel bars. 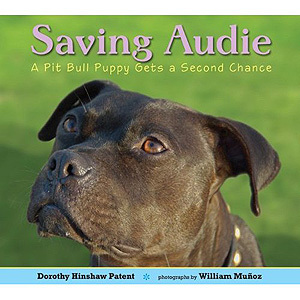 We knew he was serious when a PBH Team member spied him deep in thought one day; lying on the floor next to the kennels - one hand rubbing Gully's ears, the other holding the book 'Pit Bulls for Dummies.' Hmm. Word got around quick that our handsome piebald had one serious suitor. Planning ahead some more, Jordan knew his landlords (who were his parents) were going to be less-than-impressed with his breed choice, so he sat down and wrote a well thought-out multi-page proposal outlining all the ways he intended to be a good dog owner: How often he planned to exercise his dog, dog-friendly lodging for times he needed to travel, names of veterinarians he hoped to screen, training plans - you name it. Then, the worst kind of luck: Newspapers in Sacramento highlighted a dog attack involving a pit bull. His parents read the news and rejected his proposal. Poor Jordan wrote us in a panic: "Help!" He was crushed. His mom later told us that he stopped breathing on the phone when she gave him the news. Thankfully, unlike many breed-nervous landlords, Jordan's mom fulfilled his simple request: PLEASE go to BR's website and learn about the program that selected Gulliver as a breed ambassador. Lady Luck must have been on his side because she did, and, the rest is history. After home check and trial adoption, Jordan is now the official owner of this beautiful dog. Even better, he stuck to his promise, attended Pit Ed classes, read everything he could get his hands on, listened to every bit of transition advice we could give him and helped bouncy adolescent Gulliver become one of the "most-improved" dogs we've seen in these parts. We had to kick Jordan out of Pit Ed class this month....He and Gully just don't need us anymore. They've graduated to Linda's CGC (Canine Good Citizen) Prep Class and are well on their way to earning the prestigious title that's bestowed on dog owners who like to go the extra mile with their pets. We look forward to seeing what these boys will do next - They're the perfect example of what you can accomplish when you set your sights on what you want. In planning this year's conference, I enlisted the help of Nicole, a bold BAD RAP volunteer. Ever the optimist, Nicole contacted several beautiful potential sites; none more beautiful than The Claremont Resort & Spa in Berkeley. At the Claremont, Nicole discovered that pit bulls have friends in high places. Kim, the Executive Meeting Manager for the Claremont, is a pit bull fan. I'm excited to announce that with the help of Nicole and Kim, BAD RAP will be having its annual Conference at The Claremont Resort & Spa on September 22 & 23, 2007. Save the date and stay tuned to the BAD RAP site for registration information. This is Nina. We met her her just days before she was put to sleep in a local shelter. Her temperament, according to breed standards (and, to our standards), was not only good, but, sublime. I would've given my eye teeth to have her in our program - She was that good. But, she wasn't kenneling well, so her time was up. And, sadly, we didn't have a foster home ready for her. The next weekend, she was euthanized and a shelter worker recorded her as untreatable - In other words, unadoptable. I can't stop thinking about this dog. First, her home failed her, and then, the limitations of the shelter setting failed her. Even worse, her shelter notes - her obituary, if you will - labeled her in a way that implies that it was all her fault. Would 'reasonable care' have made Nina 'treatable?' Absolutely! But with high numbers of dogs pouring into shelter doors, limited resources for 'treating' their needs (exercise, in Nina's case), breed bias, slow adoption rates and increasing pressure to show reduced euthanasia rates, many shelters choose to mark larger dogs that aren't adopted or rescued as untreatable. Human-friendly pit bulls fall into that category ALL the time, especially if they kennel poorly, like Nina, or, if they react to other dogs or show interest in cats while at the shelter (ie, 'terrier traits'). To keep adoption rates high (big donors love high numbers) many focus energies on smaller, 'desirable' dogs that get adopted quickly. Some private shelters in CA even go so far as to travel out-of-county to find small desirables to fill their kennels, leaving their community pit bulls and other 'undesirables' behind. Good for the small dogs, bad for the Ninas. The opposition to CA's mandatory spay/neuter Assembly Bill 1634 believes that dogs like Nina aren't plentiful enough to be considered a problem. Organizations like the UKC (United Kennel Club) have stated, "There is no firm evidence that California even has such an overwhelming surplus of unwanted dogs." Of course, we disagree. Physical evidence aside (just take a peek into any central valley shelter), we're guessing that the UKC is referring to the labeling practices that render our breed and other larger breed dogs as 'untreatable' when they claim that adoptable dogs aren't dying. Dogs many consider to be 'undesirable' (those that are all or part pit bull, german shepherd, rottie, chow, akita) make up a good portion of the dogs that are put to sleep in CA shelters, and their numbers add up into an estimated half million pets destroyed in shelters each year. 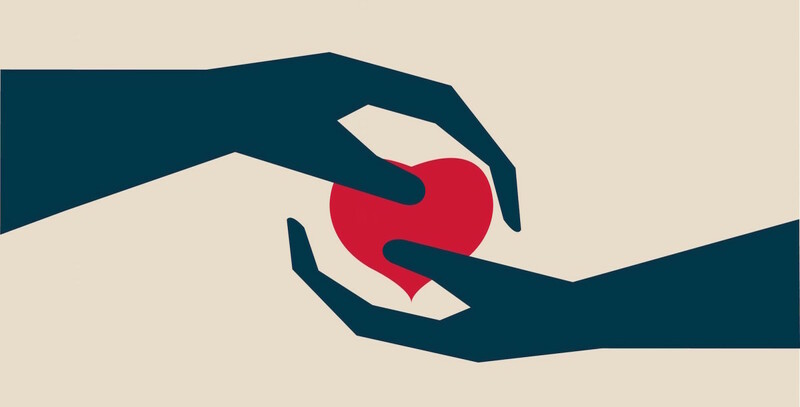 The authors of the Asilomar Accords, which promotes the keeping of shelter records, did the right thing when they made their brave challenge to shelters to reduce the euthanasia of healthy and treatable companion animals in the United States. But the fact that we keep tripping over the word 'treatable' is a constant reminder: We aren't doing our job. We're still failing our companion animals. "A good dog. Let down by humans." Rest in peace, my beautiful friend. One of our members has been wringing her hands over a pack of loose small dogs in her neighborhood for months. They rush her pit bull and bark and cause our friend and her dog mini-heart attacks every day of the week. No fun. You gotta love a Girl of Action, though. Angie dodged the small dogs for weeks (hard to do! ), begged their owners to leash up (no dice), squirted them with water when they charged (helpful only to a point) and when nothing changed, finally came up with a solution designed to keep everybody orderly. We hope her story helps others! In her words: Reasoning with the small off-leash dog owners in my neighborhood didn’t work in my case, so I began to educate myself about the local laws in my town. I got busy calling and sending emails to all of the local authorities in my area about the off-leash dog problem in my neighborhood. The Field Services Supervisor at my local humane society offered to increase patrols for leash law violations in my park, and the local police department suggested that I call them if I’m ever feeling threatened, although off-leash dog complaints don’t rank very high on their priority list (…and who really wants to bother the police about this anyway unless it becomes really serious…). My final attempt in resolving this was perhaps my greatest victory of all. 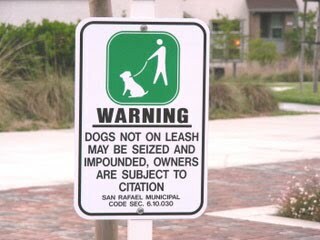 On my travels around town with the dogs, I ran into signs that said, “Warning: Dogs not on leash may be seized and impounded. Owners subject to citation." Oh, what I wouldn’t do to have a sign like that put up in my neighborhood! I contacted my local City Parks Superintendent and asked to have a few of those signs to be mounted in my neighborhood. Just ask (the right person) and you shall receive! About a month later, 5 of the most beautiful signs on the planet arrived. As the city worker was mounting them, I just had to stop and ask him for one last little favor. I asked, “Would you mind putting one of those signs up over there? (as I pointed to the row of townhouses where four members of the off-leash drop kicker contingent live). That’s where most of the leash law violators live.” He was more than happy to oblige. Hopefully my experience and efforts will help other responsible pit bull owners out there realize that there are many things that can be done to discourage and hopefully stop the irresponsible dog owners out their from putting other dogs at risk. Oh PETA -- How could you? Right as you were announcing (again) that pit bulls should be banned and grandfathered out of existence, a little boy named Josiah was falling in love with his new best friend, Miss Betty B. Bling. He's still too young to realize what PETA is, or why your members condemn his friend, or that some of his friends' parents might read your words and prevent them from coming over to his house...because of Betty. Betty, of course, is divine...As are all properly bred and responsibly raised dogs. Kids and their dogs have known this for centuries. Josiah's mom has a big job ahead of her with explaining the very adult concept of prejudice to her little guy. Unfortunately, our country has had lots of practice dividing up who is good and who is evil, and who we aren't allowed to love - Yep, this painful path has been walked before. History has also shown that it takes a brave heart to ignore the nay-sayers and follow your bliss. The other night I was reading and had her on the couch snuggling with me, she was snoring with her head on my chest. I got hit with this overhelming feeling of being completely overjoyed and sentimental at the same time (otherwise known as falling in love? ), I just broke down crying. The trust and love that dogs exhibit amazes me, I think we as humans have a lot to learn. She just seems to fit in so perfectly and knowing the long roads these dogs have to finding comfort kills me sometimes...phheew...deep breath. Yes, I love her. You just go on with your bad selves PETA -- Those of us who cherish our pit bulls firmly believe that good will prevail. Josiah, his mom and Miss Betty are great reminders why this is so.